During the month of February, 2013, Writing for Peace commemorates the Tenth Anniversary of Poets Against the War with Daily PAW Posts from a host of contributors. “The War,” taken from Migration: New and Selected Poems, by W.S. Merwin, and used here with permission from the author. William Stanley Merwin is an American poet, credited with over fifty books of poetry, translation and prose. Merwin has received many honors, including the Pulitzer Prize for Poetry (in both 1971 and 2009), the Tanning Prize, and the Golden Wreath of the Struga Poetry Evenings. 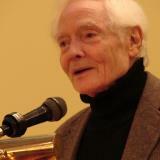 In 2010, the Library of Congress named Merwin the seventeenth United States Poet Laureate. Merwin resides in Hawaii, where he writes prolifically and is dedicated to the restoration of the islands’ rainforests.